It’s a fact. There are a lot of reputable roofing companies in Northern Virginia. But sadly, there are also quite a few who are less than honest when it comes to the facts they’re peddling. They may have their license and insurance but they may not always do what’s in the best interest of their customers. Some of them don’t give you the whole story about roof repair, roof replacement, or the other elements that contribute to the health of your roofing system. 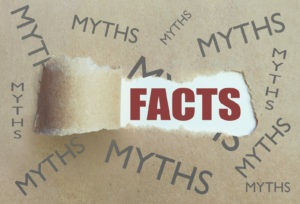 Today we’re going to dispel some myths we’ve heard from our customers that they heard from other roofing companies. MYTH. If this were true, there would be only one type of shingle. Even individual manufacturers make different shingles with different features. In general, there are two types of asphalt shingles; 3-tab and architectural. Three-tab shingles are lower in cost, last a shorter amount of time and are one-dimensional. Architectural shingles give your roof the appears of wood shake or slate. Some shingles have wind warranties, some are impact resistant, others are certified as Cool Roofs by ENERGY STAR®. All shingles are not the same. MYTH. Although a roofing overlay, the term for installing a new roof over your old one, is legal, it’s not better. In fact, in many cases the new roof won’t last as long as it could because it will be directly impacted by the old roof and the issues it had. Ideally installing a new roofing system is your best bet for a sound roof. When your roofing company can strip your roof down to the roof deck, inspect it, and install new underlayment, flashing, and shingles, your roof will last longer and better protect your home. The only thing better about the overlay is that it’s cheaper because the roofing company doesn’t have as much labor or disposal fees. MYTH. Many good roofing companies provide annual roofing inspections and charge for them. It’s well worth your investment to pay for an annual roofing inspection because your roofer can perform proactive maintenance. Small issues like loose flashing or a mis-aligned shingle can be corrected before they become a big problem and cause water damage in your attic or home which can cost you much more in the long run. If you have a roofing company you know and trust, schedule regular inspections and perform roof repair as soon as it becomes necessary. If you don’t have a roofer you trust, call Peak Roofing Contractors. We’ll perform a no obligation inspection of your roof and come up with a plan for roof repair. Let us be your partner on all your roofing, siding, and window needs. Call 703-468-4769 or fill out our contact form today. FACT. A properly installed roof will bring you and your home many years of protection from the damage bad weather can bring. And maintaining that roof with occasional service from a reputable Northern Virginia roofing company has proven itself to be a great investment.